he started out as a fallen woman looking for a savior. She then redeemed herself in a stint with a fallen rock idol. But Yvonne Elliman was sanctified as a participant in disco's greatest hour. Born December 29, 1951, in Honolulu, Hawaii, Yvonne learned how to play the piano from her father. She was part of a group in high school, We Folk, and after graduation she moved to London to try and find success in the music business. She was singing at a Kings Road club called the Pheasantry when Tim Rice and Andrew Lloyd Webber saw her and invited her to sing the role of Mary Magdalene for their rock opera Jesus Christ, Superstar. Yvonne Elliman's #1 hit "If I Can't Have You" appeared on the Saturday Night Fever soundtrack as well as on Yvonne's second album for RSO Records, Night Flight. Released in March, 1978, Night Flight peaked at #40 on the Billboard Hot 200 and remained on the charts for 17 weeks. 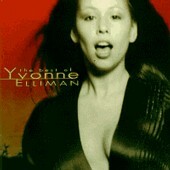 In 1997, Uni/Mercury released The Best of Yvonne Elliman (above), a 16-track compilation which contains all five of her Top 40 hits. When the album evolved into a stage production, Elliman stayed with the part for four years. Her original recording of "I Don't Know How to Love Him" was released as a single, and while it did respectably, charting at number 28 in June, 1971, it was surpassed by a cover version from Helen Reddy. In 1974 Yvonne relocated to New York for rehearsals of the Broadway production of Jesus Christ, Superstar. There she met Bill Oates from Robert Stigwood's office and they were married soon after. Later that year, Elliman was at Criteria Studios in Miami, Florida, when Eric Clapton was recording 461 Ocean Boulevard for RSO Records. He asked her to sing backing vocals on "I Shot the Sheriff," which led to joining the heavyweight guitarist for his fabled comeback tour. She was signed as an artist in her own right to RSO. Her Rising Sun LP was produced by Steve Cropper, but yielded no hit singles. Teaming up with producer Freddie Perren, she recorded the Love Me album, which gave her two Top 20 hits: the sizzling title track written by Barry and Robin Gibb and a remake of Barbara Lewis' "Hello Stranger." She told Rolling Stone she felt "like a traitor" for leaving Clapton. "My voice doesn't lend itself to screaming," Elliman told the magazine. "It really prefers to sing love ballads. I'm a complete romanticist as well. I like appealing to women. I like pulling their heartstrings." She almost got her chance to pull a few heartstrings. When the Bee Gees were asked to score Saturday Night Fever, they had already written "How Deep Is Your Love" for Elliman, but Stigwood insisted the Bee Gees sing the ballad themselves. 1. It was the fourth number one single from the Saturday Night Fever soundtrack, the only motion picture to produce that many chart-topping 45s. 2. It was the fourth consecutive number one single to be written by Barry Gibb, breaking the record set by John Lennon and Paul McCartney, who penned three consecutive number ones in 1964. 3. It was the sixth consecutive number one single for RSO Records. No other label until that time had ever had more than two consecutive 45s reach the top of the Billboard Hot 100. RSO dominated the chart summit for 21 weeks in a row, and would log another 10 weeks at one before the last day of 1978.